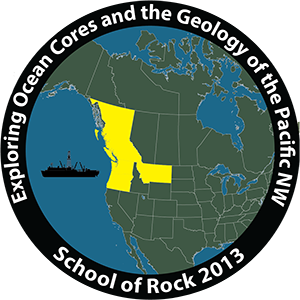 During this School of Rock, participants will convene in Victoria, British Columbia for an engaging and hands-on professional development experience aboard the RV JOIDES Resolution. Their 12-hour days will be spent working along-side a dynamite team of instructors and crew who will guide them in an exploration of cores and other data from the Pacific Northwest region and beyond. Using the high-tech laboratories on board, and their own observational and problem-solving skills, participants will be challenged to integrate diverse sets of data obtained from below the ocean floor to recreate the geology and history of the Earth. Much of their experience will also involve dynamic education-related discussions and time to develop programs and products that focus on what they learned, the JOIDES Resolution, and scientific ocean drilling.